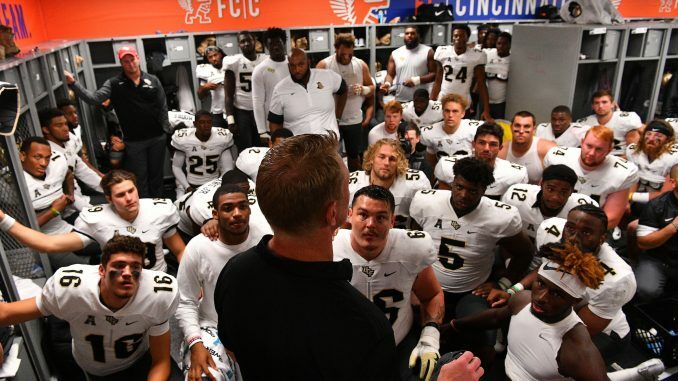 UCF hit the road over the weekend and dominated Cincinnati 51-23 in a weather-shortened game. Next, the No. 22 Knights (4-0, 2-0 AAC) will return to Spectrum Stadium for homecoming, hosting East Carolina on Saturday. What else went down around the AAC in week six? If it wasn’t clear when the Knights came in at No. 25 last weekend, it’s even clearer now. UCF, now at No. 22, has firmly established itself in contention for a New Year’s Six bowl game. In some ways, the rest of the AAC helped that case this weekend. Navy stayed undefeated and came in at No. 25 in this week’s rankings. Should the Midshipmen beat Memphis this weekend, it will likely set up a top-25 matchup when the Knights travel to Annapolis on Oct. 21. USF, of course, stayed undefeated due to being idle this week. The War on I-4 rivalry game on Black Friday still looks like the big game that will decide the AAC East. If UCF can run through its schedule and win the conference, its résumé will certainly be strong enough to warrant a big bowl berth. As for the rest of the conference, there again weren’t too many surprises. Houston is still a dark horse to come out of the AAC West, while Memphis showed promise after a big loss to UCF at the end of September. East Carolina, UConn and Tulsa are locks for the bottom of the AAC. Temple, Cincinnati, Tulane and SMU aren’t quite there yet, but will likely finish in the middle of the pack. As the weeks go on, the division races will heat up. Next weekend is a big one for the west, as Navy and Memphis square off. For UCF, it has to be business as usual against a bad ECU team.